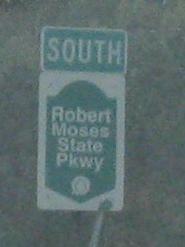 New York Roads - Robert Moses State Pkwy. SB at NY 104 as it turns south from Ridge Rd. at the southern end of NY 18F, courtesy Doug Kerr. 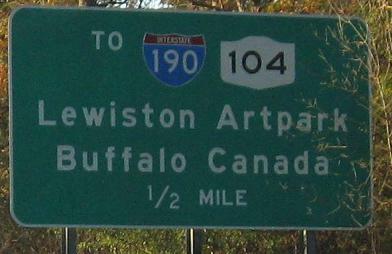 Buffalo, Canada you say? Please give directions. NY 384 connects Robert Moses State Parkway in Niagara Falls because the part closest to the Falls has been closed off and converted into more of Niagara Reservation State Park. Several more miles of the southbound Parkway have been converted to trail, or at least closed to vehicles - the empty roadway does not appear to be useful to anyone yet. Click on the links below to see those two sections of former Parkway. 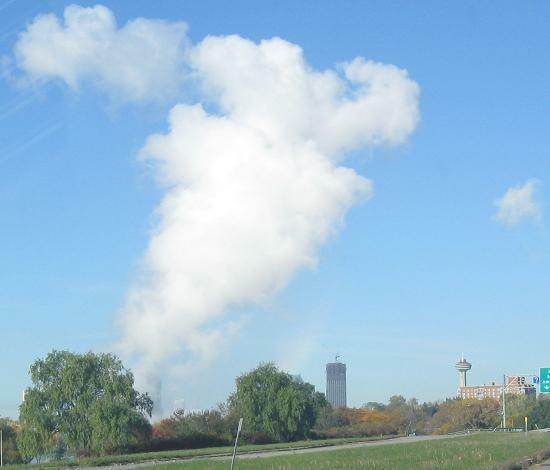 Heading north from LaSalle Expwy., with the I-190 North Grand Island Bridge flying overhead, to a plume of Niagara Falls mist with Niagara Falls, NY and ON in the background. Only Horseshoe Falls (the largest, most famous, and least visible from the U.S.) produces the mist.